The second iteration of an exhibition exploring trends in contemporary abstract art is now on view at Nebraska Wesleyan University’s Elder Gallery. The first version of the show took place last year at The University of Missouri and the exhibition will travel again in 2019 and 2020. The main change in this 2018 version is that additional artists have been added, moving the roster up to 20 individuals – 13 women and 7 men. The works have also grown in diversity, with more sculpture, assemblage, photography, and fibers works entering the constellation. Works by Erin King (wall) and Sumire Taniai (on pedestals) appear along the title wall. 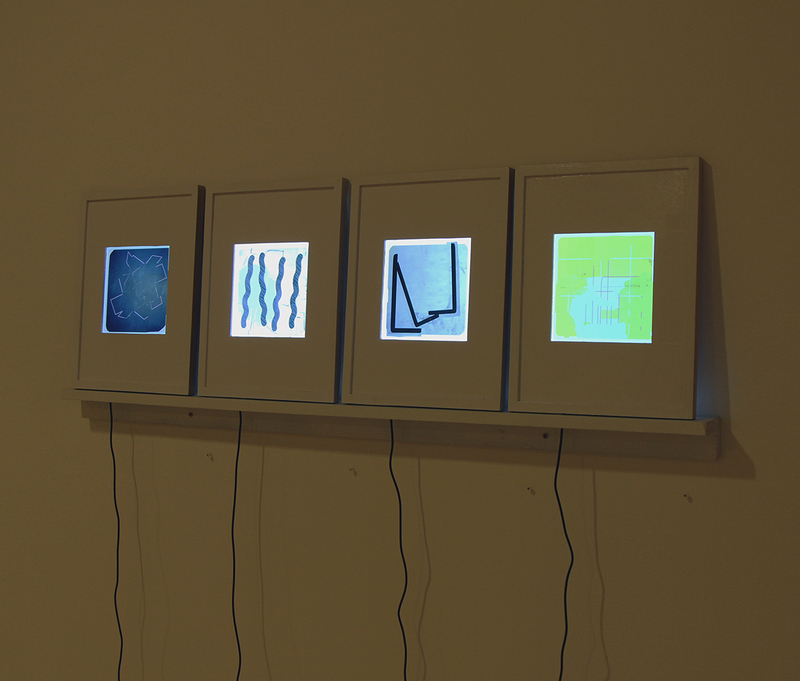 Two works by Ryan Crotty, a tiny relief fibers piece by Hali Moore, and four digital works displayed on iPads by Sharon Butler. This show centers on the work of Anna Buckner, Sharon Butler, and Gianna Commito. A constellation of 17 other artists appear in this view into contemporary abstraction, and their work incorporates Painting, Drawing, Digital Drawing, Photography, Fibers, Assemblage, Collage, Sculpture, Relief carving, and other forms. Sarah Arriagada, Anna Buckner, Sharon Butler, Gianna Commito, Ryan Crotty, Joel T. Dugan, Dan Gratz, Michael Hopkins, Erin King, Kristen Martincic, Marcus Miers, Hali Moore (Oberdiek), Justin Rodier, Elise Rugolo, Amanda Smith, Lauren Steffens, Sumire Taniai, Jm Thornton, and Jennifer Ann Wiggs have work in this exhibition. Click on their names to see their websites and find out more about their work. 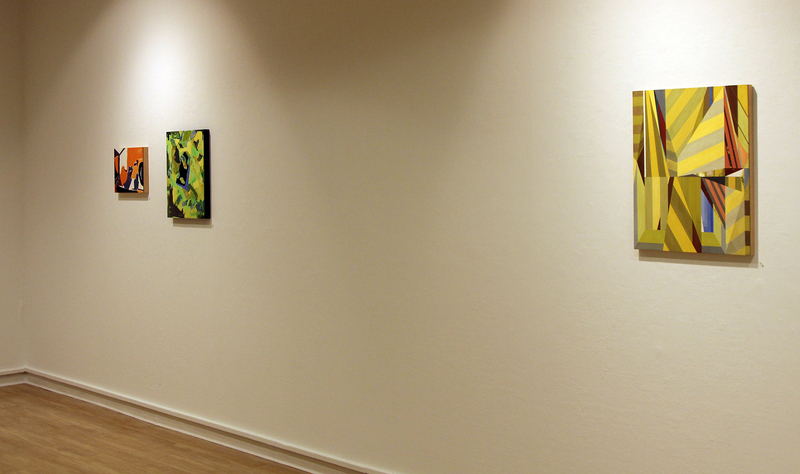 Three works by Gianna Commito engage with three works by Amanda Smith in this view of the exhibition. As you can see from the exhibition listing at NWU’s website, I’ll be at the gallery on December 7 to talk about the show and answer questions. I’ll also spend some time meeting with students and engaging with the school community. I love the chance to spend time in the space with the work and field questions in the moments of viewer experience. The works are meant to be seen, interpreted, and extrapolated. 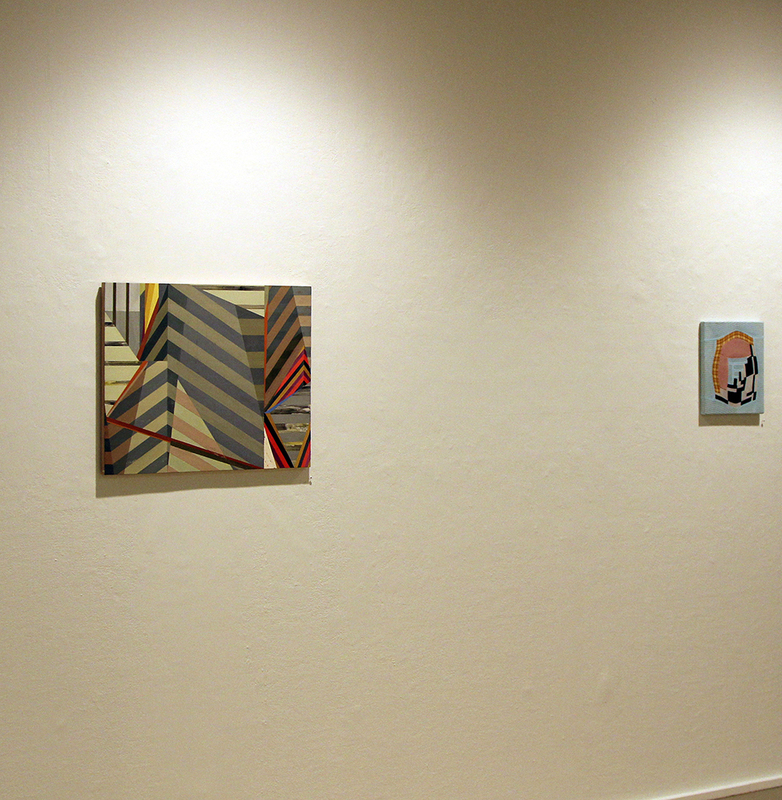 Three collaborative works – collectively a “Curator’s Statement” – by myself and Joel T Dugan are seen here on the left. A wonderful dimensional graphite and folded paper drawing by Marcus Miers and two sculptures by Lauren Steffens continue to the right. This wall, featuring tight formations by Sarah Arriagada and Kristen Martincic, is one of my favorite views of the show. These few views can’t really give you a true impression of the show. I hope if you’re nearby you’ll stop in. My efforts to curate interesting collections of works are definitely becoming more and more important to me as an artist and educator. 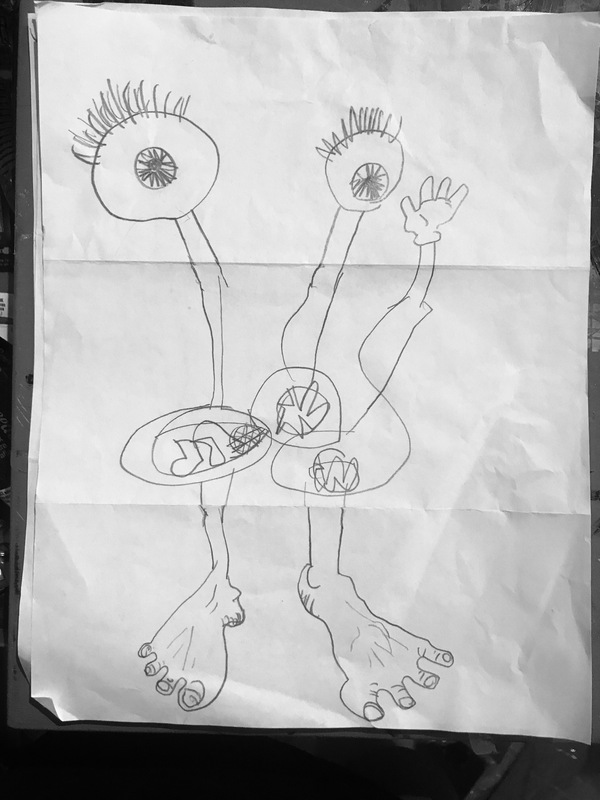 Particularly, with an exhibition such as this one, I am afforded the chance to expand and contract a specific intellectual and aesthetic gesture. I find that tremendously exciting. This iteration of the Restraint and Limitation show is probably the most expansive version that will happen, so it’s intriguing to sense how constrained it still feels. I am passionate about small works that distill meaning and experience, defying long-held notions about what art is supposed to do. Three amazing fiber works by Anna Buckner hold a wall next to a strangely evocative photographic/found object assemblage by Justin Rodier. The logic of abstraction cannot be reduced to a few dudes painting in mid-20th century America. This exhibition is meant to present another view. Anna Buckner, Sharon Butler, and Gianna Commito, the three core artists presented here, show commitment to the aesthetics and procedures inherent in abstract painting while bringing diverse pressures, materials, and processes to the form. – Matthew Ballou, October 2018. Photos in this post are by Michael Larsen. Examples of various line manifestations from my foundations drawing course. I’ve taught hundreds and hundreds of students beginning observational drawing methods for over a decade at Mizzou. This is something I’ve been stimulated, encouraged, and challenged by. It’s wonderful to be a part of an ancient tradition. 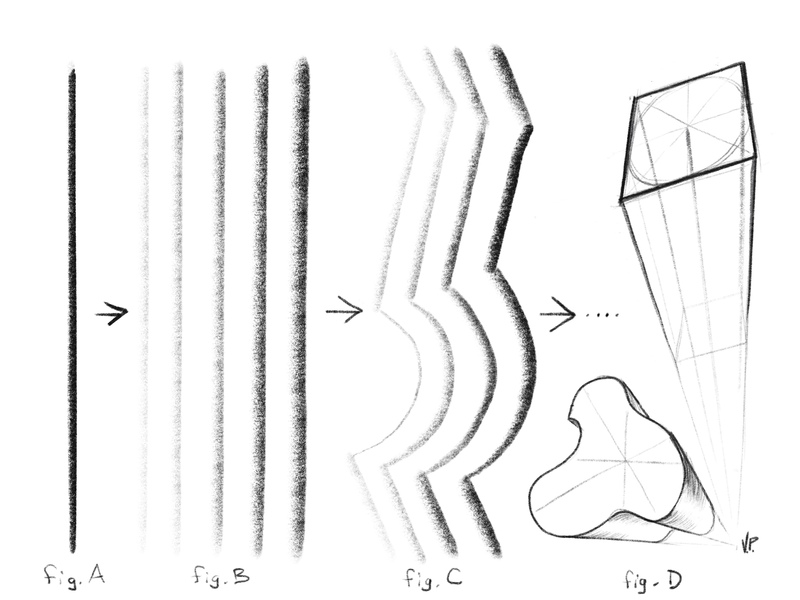 One of the main points of the first few weeks of my Drawing: Materials and Methods course (foundations level drawing for beginning students) is the notion that line, in and of itself, doesn’t make an illusion of space (fig. A). 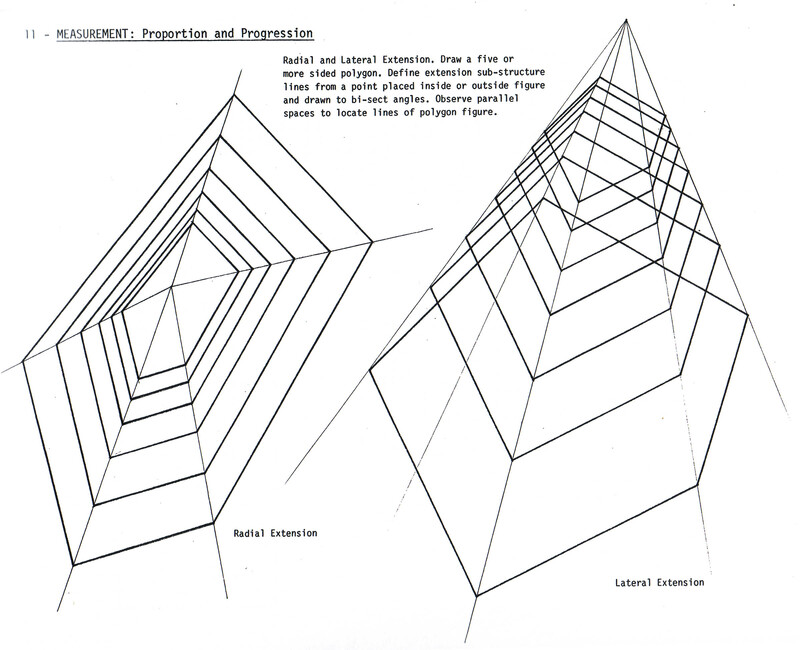 Rather, value – the quality of light and dark – creates a perception of space (fig. B, C). 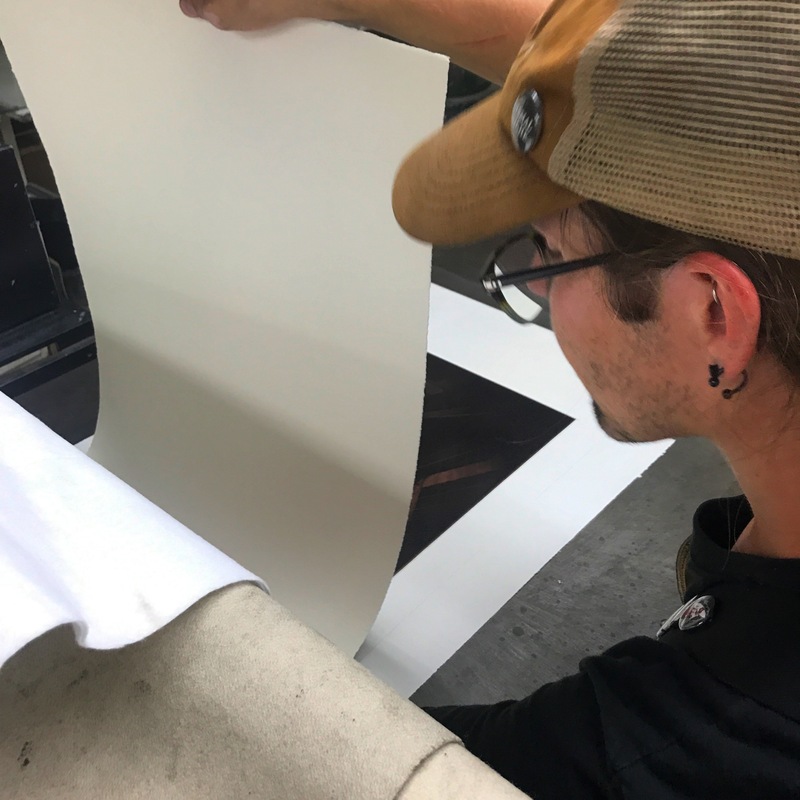 To develop value we accumulate lines, adjust pressure on the tool, or blend the material with which we’re drawing (among other actions) in order to attenuate or amplify the line quality. 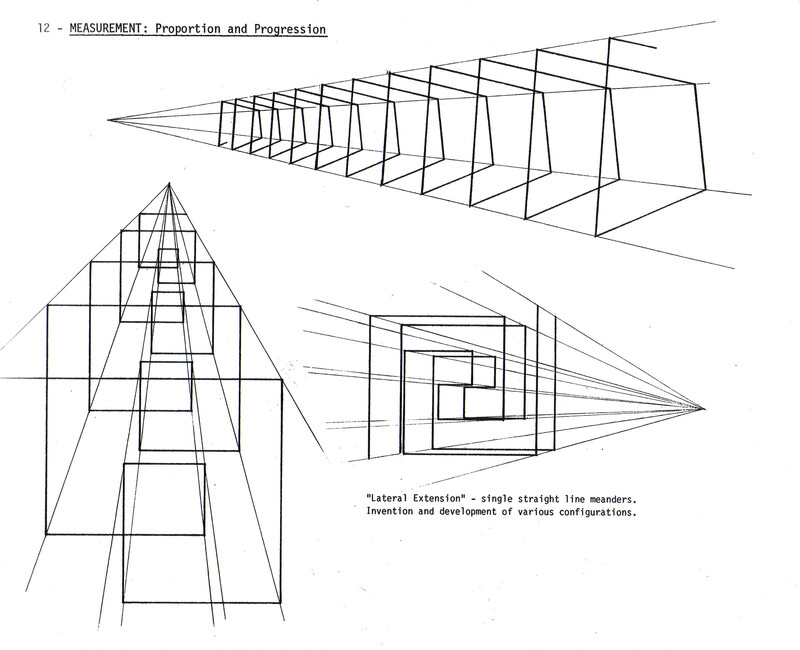 The coalescing lines form a varied superstructure representing – in 2D form – the perception we have of 3D space (fig. D). These and many other lessons are certainly intuitive and, though they are not an exclusive method, do help novices recognize space and how to translate it. The first few drawings my students make are centered around these concepts. 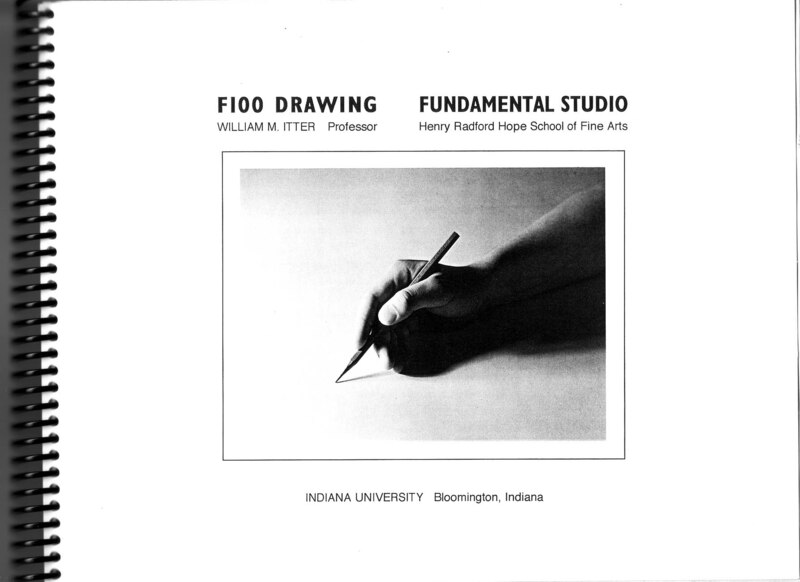 It was Professor William Itter’s Fundamental Studio Drawing text that I used in developing my own pacing, scope, and sequence in the teaching of Beginning Level drawing. At Indiana University, Itter was a strong force. Having taught there for more than 35 years when he retired in 2009, Bill crafted and then honed a foundational drawing system that influenced me and many of my fellow grads. Over the years a number of the projects he either developed or adapted have been a part of my teaching. In particular, I have been inspired by his Cornice Combo and Linear Topographic Contour projects. Most of us ended up with physical copies or PDF prints of Bill’s collection of projects and syllabus materials (pictured above). I think you can see the through-line of intention when you see Bill’s project examples and compare them to what I do in class. While I no longer directly reference Professor Itter’s text, it is a strong part of the pedagogical lineage I claim as an educator. Below you can see some of Itter’s Radial and Lateral Extensions, which were influential in my own Atmospheric Beams project. Atmospheric Beams by Robert McAnelly. 18×24 inches. Meandering Band by Hannah Westhoff. 18×24 inches, graphite on paper. Meandering Band by Katie O’Russa. 18×24 inches, graphite on paper. 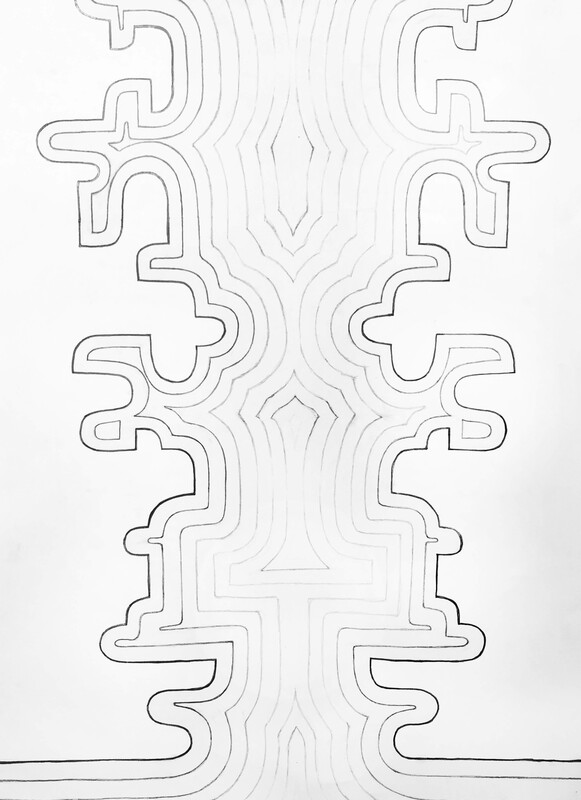 Meandering Band by Seth Steinman. 24×18 inches, graphite on paper. 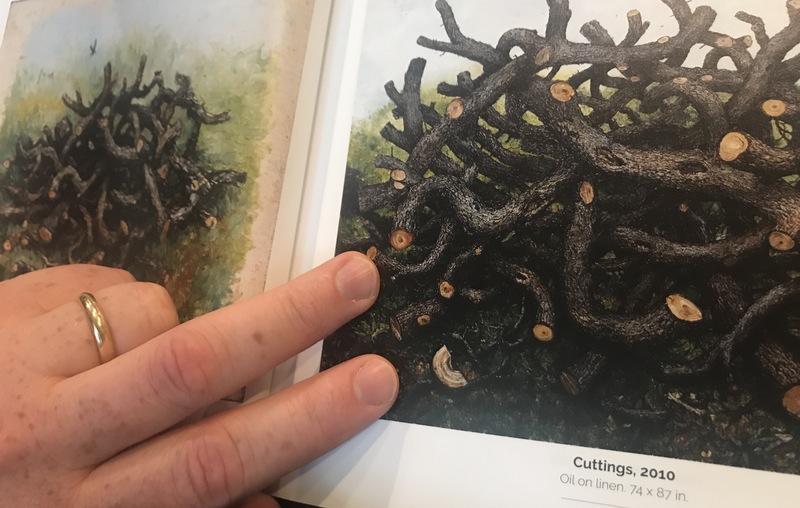 My ultimate aim in carrying on a very truncated version of Bill’s foundational drawing projects is really an attempt to establish the importance of observational iteration in my classes. All of my classes are, at their deepest center, about attention and awareness. My hope is that continuing to use a few of Professor Itter’s projects my students gain an understanding of what their eyes are doing in the world. The way we amalgamate visual and material structures into meaningful ideas is part of what makes us human. Now that we are living in an age where algorithms designed to manufacture our purchasing consent drive much of our cultural events and expressions, it is so important to grow in our awareness of how we are being manipulated by these systems. This understanding begins with a knowledge of visual dynamics and the ability to take command of how our eyes operate. 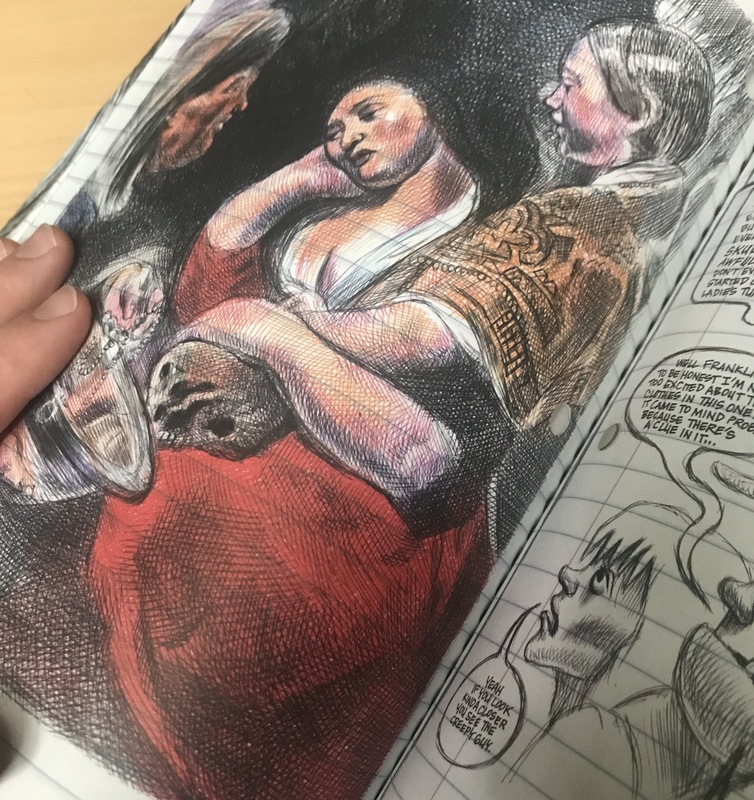 I think Itter knew this when he created his foundational drawing projects, and I try to bring that tradition of thoughtfulness into the 21st century. Chris Hall – Thrustmasters. Oil on panel, 7×10 inches, 2012. Chris Hall is a great guy. He’s a solid dude. He’s easy to get along with, to talk about Dune with, to consider the pros and cons of kayfabe with, and to think about art with. 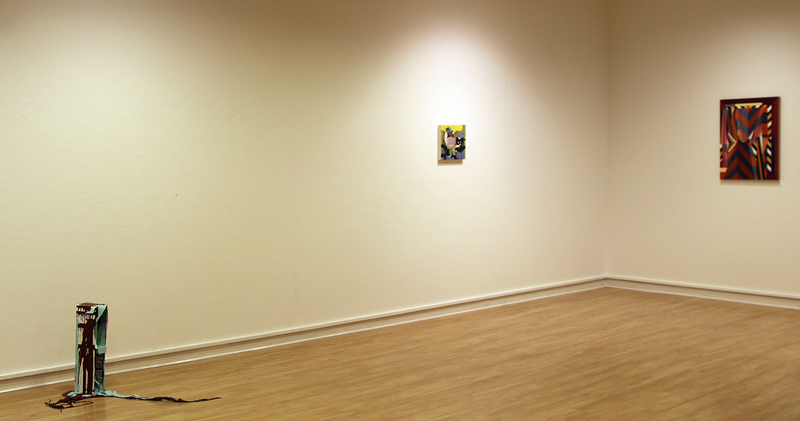 Back in 2011 Chris came into the MFA program at Mizzou and quickly stood out. Not only was he a good painter with interesting ideas, he was also willing to let his assumptions go to grow. His thesis work was among the strangest and most unique I’ve had the privilege to see. Check out his ongoing work at his website. Chris has the unique ability to draw out both mirth and serious, intense thought in those around him. I’ve loved partying with him over the years, and I look forward to more fun in the future. Above: Chris as Nosferatu and me as Igor in a drawing I made… this is how we party, people. Ballou digital drawing, 2017. I have two artworks from Chris in my home. The first, Thrustmasters, is at the top of this post. And here is an untitled fridge interior from around the same time – 2012 or 2013, just as Chris was moving into his Thesis work. Chris Hall- Untitled Fridge Interior (Vampiric Food). Oil on panel, 7×10.5 inches, 2013. Chris is one of my favorite subjects for illustration (I’ve drawn caricatures of my friends, family, and students for many years). Not to be outdone, Chris had me pose for a number of his paintings early on, and those sessions are some of my favorite moments in academia! Me posing for Chris… meme-ified. Chris shaking his groove thang… Ballou digital drawing, 2016. I have curated an exhibition at the George Caleb Bingham Gallery at the University of Missouri called Restraint&Limitation. This show features the work of Anna Buckner, Sharon Butler, and Gianna Commito, along with some people with connections to Columbia, Missouri – Hali Oberdiek, Jessica Thornton, Elise Rugolo, Lauren Steffens, and Jennifer Ann Wiggs. Lauren Steffens’s floor piece, Rugolo’s encaustic work, and Gianna Commito’s sharp-edged abstraction in the exhibition. It is a spare, economically arranged show. It’s openness grew out of my musings on abstraction of all sorts. I have long felt that bigger is not really better when it comes to abstraction, and I set out to bring together just a few examples of works that do this. Here is my curatorial statement for the show (a text/painting pair) with a number of shots of the installation interspersed. There will be a catalog of this exhibition available soon. Detail shot of Ballou’s Curator’s Statement. Contemporary abstraction is a huge, multifaceted project. From Katharina Grosse, Julie Mehretu, or El Anatsui to Cordy Ryman, Odili Donald Odita, or Amy Sillman, the range of potential and diversity of referent available to artists is obvious. There are no clear boundaries, no distinct definitions that provide a unified perspective on the practice of abstract painting. That contemporary abstraction utilizes the history, physical interactions, and conceptual structure of painting is axiomatic. Yet to suggest that it is limited to the realm of painting is a dramatic misunderstanding. 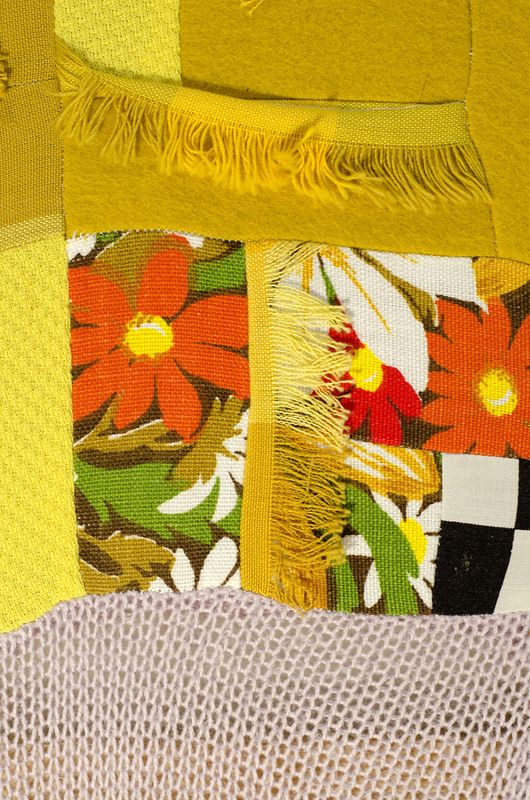 Detail of Anna Buckner’s Dutch Still Life. The old discourse that endlessly returns to the interplay between abstraction and representation has lost any potency to report on what is actually happening in much of contemporary abstraction. With this exhibition, I hope to present a sliver-like view into the modes of abstraction that intersect with painting as a form and which, in unique ways, demonstrate the limitations of depiction and representation to clarify the kinds of experiences that abstraction affords us. I also seek to show how smaller works may defy the conceit that abstraction is most powerful in its more monumental expressions. Commito and Buckner works hanging in the show. 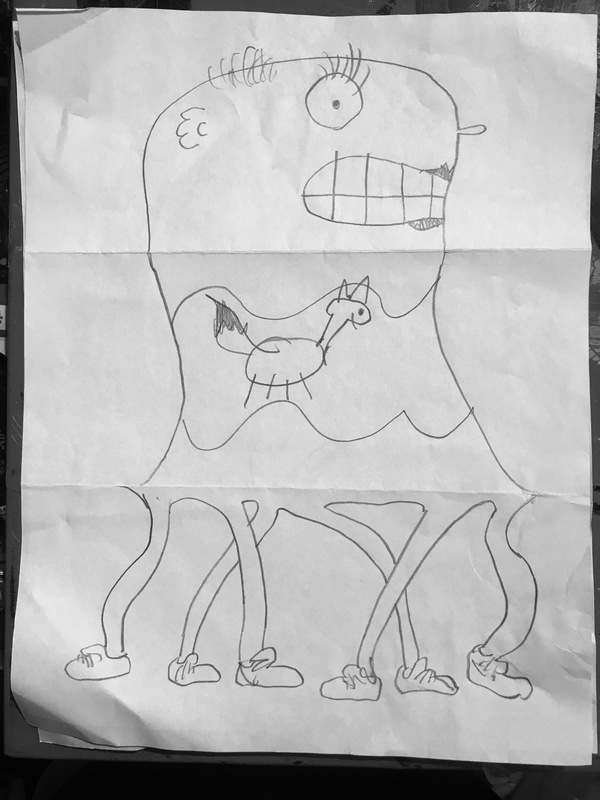 A side view of Butler’s four goodmorningdrawings and their presentation. The three primary artists here are women from different stages of their careers. They show commitment to the aesthetics and procedures inherent in painting practice today, yet bring diverse pressures to the form. 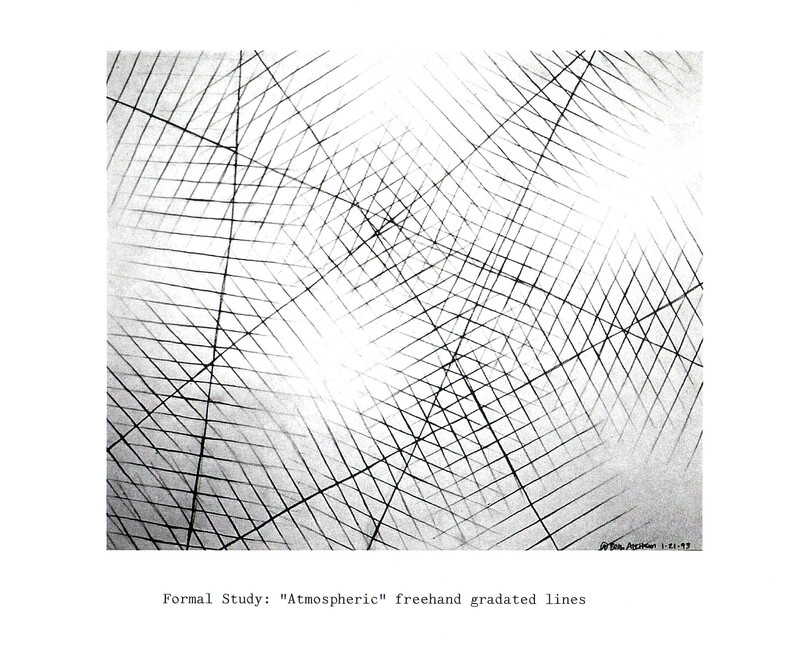 Buckner – a newly minted MFA – pieces scraps of fabric into small, taut grid fields. Butler – with decades of art making and writing behind her – brings us small digital drawings created on her iPhone. Commito – a mid-career educator and artist with broad impact – focuses on sharp geometries and wonderful chromatic synergies. Their influences – ranging from post-paint materiality to provisionality to traditional hard-edged painting – form an invigorating view into a restrained yet evocative corner of artmaking. 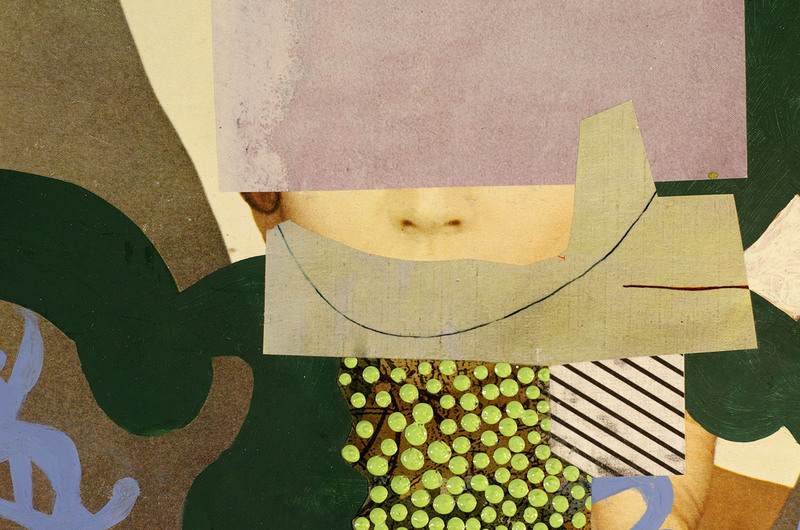 Detail of an Elise Rugolo work. Grouping of Wiggs pieces, with Commito off to the right. I was particularly excited to have Butler in this exhibition – ten years ago we participated in an online “shared critique” event that took place on the now defunct Thinking About Art blog. I was writing about the work of someone else, but Butler was assigned to write about one of my paintings. I thought her response sharp, knowledgeable, and strong. Though she did seem to dismiss that work, I was pleased to have her voice address my art making, and I have followed her closely ever since. Her art making, writing, and blogging – especially with the influential site Two Coats of Paint – are important. I’m really glad to have be a part of this. Another view of the installation of Butler’s works. In my experience, there are very few artists who are NOT, at heart, essentially collaborative (I recently wrote about artist collaborations here). Certainly there is a neurosis to creative living that sometimes results in isolation and resistance to the free flow of ideas and actions. That’s a stereotype, though. 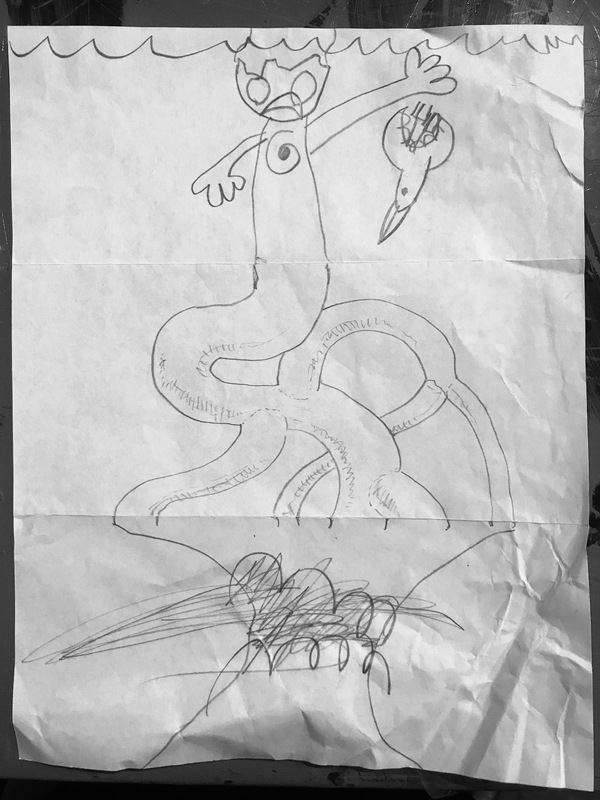 Above: Three Exquisite Corpse drawings I made with two of my daughters – Miranda and CaiQun. Graphite on paper, 11×8.5 inches, August 2017. The truth is that we find strength in our collaborative efforts. This is true whether the collaboration is in the context of specific works of art or if it is (as it often is) in the context of making community. So many artists I know advocate for each other – that’s collaboration. So many artists I know curate shows, craft opportunities behind the scenes, and act as allies to those around them. That’s real collaboration. They do this without expecting or needing a slap on the back. In my own life as an artist, especially since I started teaching full time, collaboration and shared creation has been gigantic. I also think my children have played a huge role in developing my sense of receptivity and shared ownership of creative endeavors. We aren’t islands. We don’t have to be disconnected. Connection is hard – it makes us vulnerable and awkward. It also forces us to mature, to live beyond a kind of precious singularity or purity of thought and action. It asks us to believe in other people and to believe in ourselves. I’m posting a few of my current/recent collaborations here. Of course, my best and most central collaboration is with Alison. But in terms of art, the pieces I’m showing here are ones I’m really proud of. Above: Collaboration with Kyle Hendrix – in progress. Ceramic, paint. Approximately 10x10x10inches. 2017. Below: Works made with Joel T Dugan. First is Plié – Oil, acrylic, marker on shaped panel. Approximately 10.5 by 10.5 by 1.5 inches. 2016-2017. 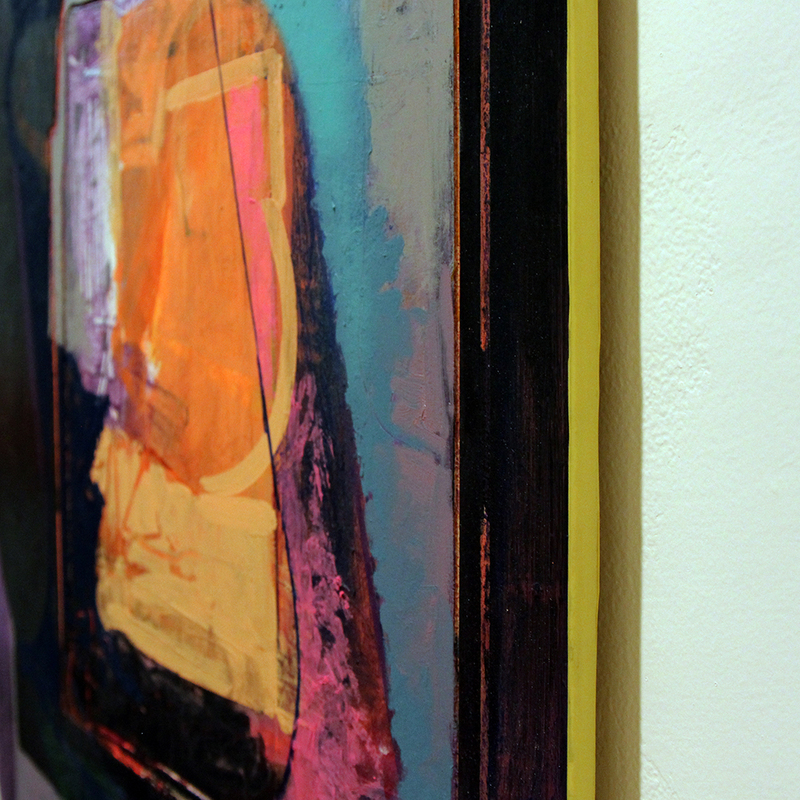 Below that is Jaunt – Oil, acrylic, marker and spray paint on shaped panel. Approximately 11 by 11 by 1.5 inches. 2016-2017. The collaboration with Joel has been very important to my development, especially since my heart attack in 2016. There is a constellation of Indiana University MFA grads scattered across the US, and I feel as if we are all constantly jostling each other. It is not uncommon to see many of us working together. I think that says something about the strength of that program. I am always aware of what many of the IU people are doing. Their work motivates me and challenges me. Another friend I’ve worked with on and off over the years is my former student Allison Reinhart. 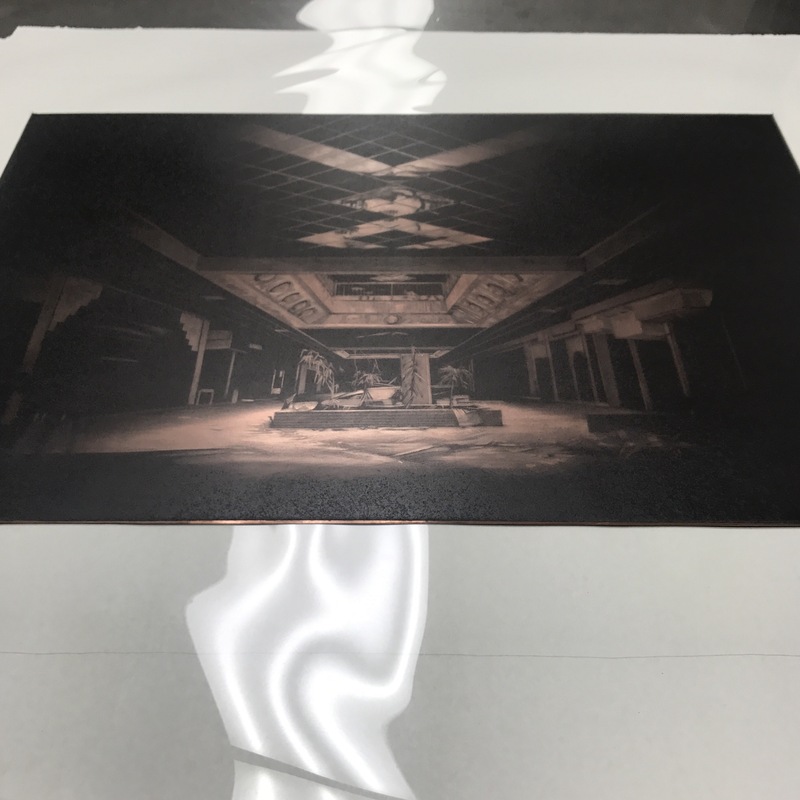 We’ve worked on a variety of projects over the years, from exhibitions to prints, but right now we are building a very special box. The mirrored box, which I am fabricating, and that Allison conceptualized and is designing the external features of, is a container of containment. 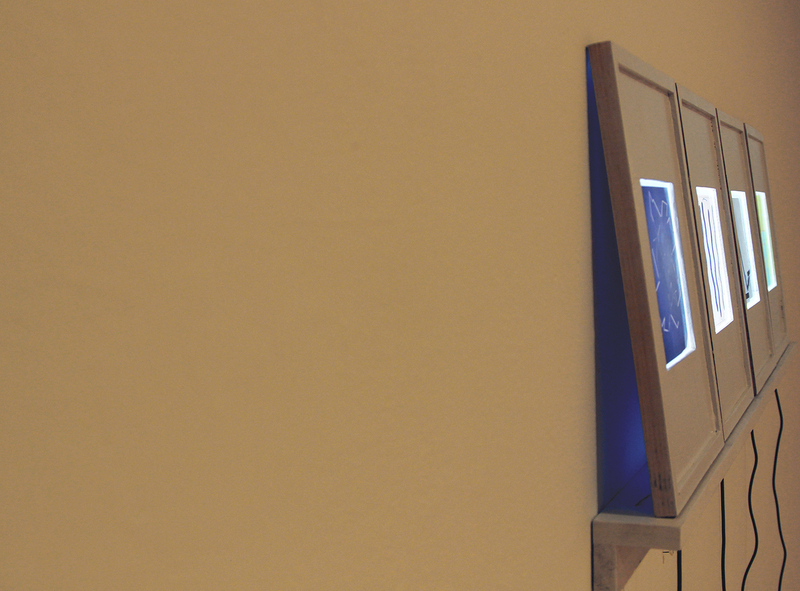 Above: views of the mirror box – approximately 14x14x14 inches, 2015-2017. My professional work over the last half decade has included a significant curatorial component. This means building proposals, playing with ideas, working with artists, finding funding, giving talks, and really so much more. I’ve gotten the chance to work with some of my heroes – like Anne Harris and Tim Lowly – through this process. Right now I’m coordinating with several awesome artists for a show that I hope with travel to a number of venues – our first exhibition opens at the George Caleb Bingham Gallery at the University of Missouri the last week of September 2017. In particular, it is so wonderful to have the chance to present works by Sharon Butler and Gianna Commito. These women are two of my favorite painters, and the way they challenge and nurture painting as a form is inspirational. Perhaps the most effective art collaboration I have is the one with Deborah Huelsbergen at Mizzou. Deborah is a graphic designer, lover of mandalas, and fierce advocate for the power of teaching. She LOVES it. She LIVES it. And our university is better because she’s here. Over the last few years Deborah and I have gotten to give a number of workshops and orientations together, and I just love getting to share the room with her wisdom and passion. Whether we are leading other educators in exercises to stimulate their own creativity or helping new grads understand how to handle their classrooms, we always seem to know how to wordlessly coordinate. Deborah is awesome! I am really looking forward to my upcoming collaborative exhibition with former student and current friend Simon Tatum. Whew – the Cayman Islands?! Colonial histories?! Cultural excavation and interrogation?! It’s going to be amazing – check back for more information. And how could I mention collaboration without talking about my work with Marcus Miers? You Show Me Yours, I’ll Show You Mine. WOW. Above: Photographic pairing – a shared work by Matt Ballou and Marcus Miers, 2010-2011. We showed these works at the 930 Art Center in Louisville, KY once. There are MANY more instances I could go into (like making beer with Norbz), but perhaps the best collaboration to end on is the one I have with my students. They come from all over the world. They have all sorts of different experiences and expectations. Yet, without fail, every semester we work together to build a fun, challenging, strange, stimulating learning climate that makes a difference. I couldn’t do it without them. Making paintings, crafting shows, team-teaching… so many ways to become more than myself. I’m very grateful for that. Here’s to collaboration! 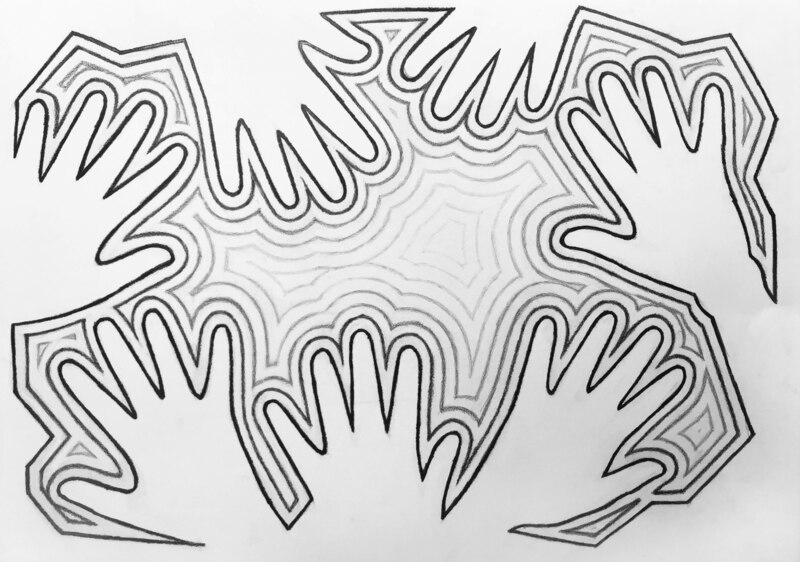 Collaborative Online Drawing – for more information see here. Me, teaching in 2011. Photo by M. Kannan. Ten years ago this month, I arrived in Columbia, Missouri to start teaching painting and drawing at the University of Missouri. I remember the experience of arriving in town well. My wife was reading to me from the new Harry Potter book (Deathly Hallows was just released the week prior) and we, being Missouri newbies, inadvertently took a scenic route from Chicagoland to MidMo. Those first months were nerve-wracking. It was a one year Visiting appointment (Eventually it was extended, then extended again). I loved the challenge and pretty soon felt at home, especially once Alison joined me. By 2010 I was able to apply to a Teaching Track position. Triumphant with former grad Ian, 2012. I really am one of the lucky ones. Unless you’re living the art/teaching life, I don’t know if you can comprehend just how lucky. Yes, I’m a competent teacher. I’m a vigorous and engaged artist. But my art-making is not revolutionary, it is investigatory. I don’t believe in originality, I believe in interrogating meaning and experience by acknowledging the vast array of cross-contextual elements that surround us (histories, cultures, systems of thought, traditions of creativity, etc). Just as nothing that I make exists on its own, so too my teaching is based on the broad constellations of influences that have coalesced into my particular perspective. My frame of reference is not only my own, it’s a kind of index of everyone and everything that has inflected my understanding. Posing for one of my former grads, Jake Johnson, way back in 2009. Photo by Jake Johnson. Ultimately I’m not a huge standout from the other (VERY small number of) MFA graduates who are able to keep up the studio work, exhibitions, and become embedded as an educator. I learned early on that teaching scratched the same itch as painting did for me. I’ve used that. I’ve lived that. If I’m down, feeling blown out and sort of worthless – put me in front of a class of 20 twenty year old undergraduates. I’ll come out supercharged. That’s the power of working with human beings who are in the midst of a transfiguration of personality and purpose. I love teaching. Consider it: I get to think about art, creativity, and even BEING itself for a job. I get to push paint around, push ideas around, and push minds around (including my own). I get to mentor and be mentored by amazing people. I get to work with creative humans of all ages, backgrounds, worldviews, and experiences. I get to read and write and speak about things that move me. I get to show my work around the country (and sometimes around the world). I get to spend time exploring what it means to make things in the world (and what it means for things to make us who we are, too). I get to share those realms of exploration with others. I’ve gotten to travel around the world to adopt two of my children. I’ve been afforded the chance to elevate my standard of living well beyond what it was while growing up. I have the privilege of good insurance and great health care – two things that have made the quality of my post-heart attack life, and the life of my daughter suffering from osteogenesis imperfecta, much better. I’ve become a home owner. A mini van owner. A back yard mower. With former grad Jane Jun at the old Shakespeare’s, 2012. With former grad student Laura at a gallery opening, 2014 or so. All of these things have come to me through the blessing of employment at Mizzou. It is “an honor and a privilege”* to go into my classroom, greet those faces, and set off on a task of vision and awareness. So many have challenged me and moved me forward. Bill Hawk, now retired, calling me out in my first talk at Mizzou and asking me to point out what I meant by an abstract assertion I had made. Lampo Leong, telling me to “just teach them” in that first class. Dr. Adrienne Hoard, guiding me in the subtle art of holding a grad student’s feet to the fire. 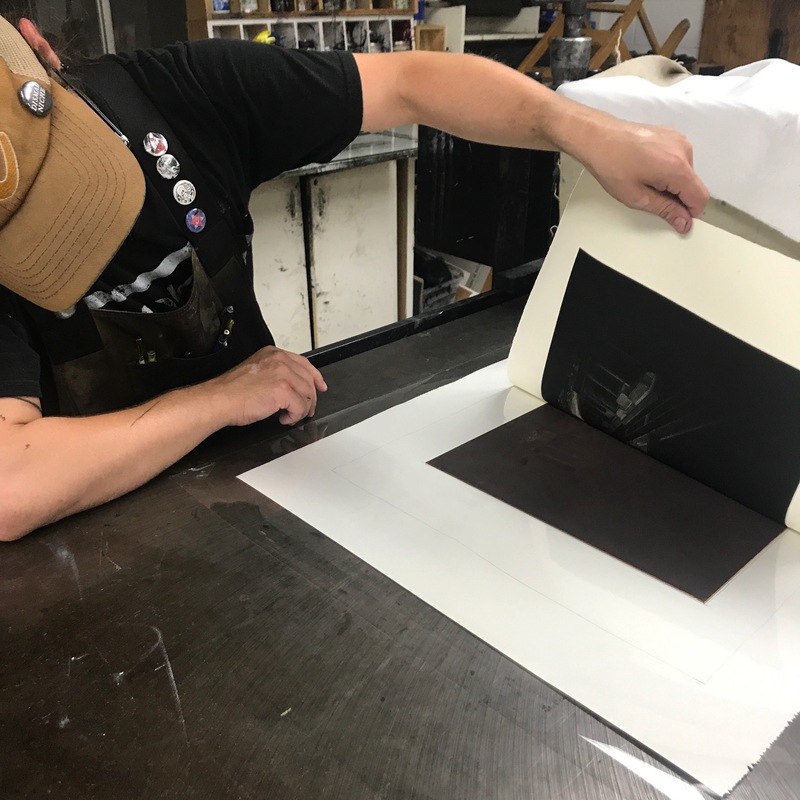 Professor Chris Daniggelis, feverishly baptizing me into the art of mezzotint. Catherine Armbrust and the latex, Jane Jun and identity ghosts, Eric Sweet and the teeth, Maurice and the parking mountain, Shannon and the tree outside the art building, Tina and Midwestern dreams, Norby and graying out, Marcus and awkward dad jokes, Emily and softball excellence, Simon and Caymanian memory… so many more. So much love, and work, and determination. So many reasons to be grateful. Joke meme image I created for Chris Hall. Quality time with former student Marcus Miers, 2016. The first round of grad students I worked with still loom large in my mind. Ian, Sloane, Nancy were the first… then Natalie, and then Chris, Jane, and Norby… eventually Colleen and Nikos… Each and every one brought a unique inflection to my experience of the world. I am so much better for having spent time with them. With Lishan, Simon, and Sumi at an art opening a few years ago. Photo by Bobby. There are so many stories I could put down: grilling pizzas with Maurice, brewing beer with Norby, taking art trips with everyone, having wonderfully intense conversations in Graduate Theory classes, and hilariously irreverent conversations over beverages at any number of our local establishments. I’ve had many wonderful students from China, and I’ll never forget Peking Duck with Jackie or making won-tons with Tianyuan and our children in the kitchen. I’ll never forget when I got to officiate the wedding of two of my former students. I’ll never forget the response of my students and colleagues to my heart attack, and how they supported me and helped me through it. Jake, visiting for an evening of food and drink, 2008 or so. Nancy isn’t impressed, 2010. I know that I can’t really express what all of this has meant to me. If I had to bring it all down to the most important thing, I think I would say it’s time with the students. That’s what secure employment for teachers creates. I get the time to get better at teaching and the students get the value of an educator who is growing alongside them. Continuity – hours and days over the long haul – makes the difference. Those students see me living day to day and I see them living day to day. The ones who get it, who really believe they are real and that others are real, who believe in translating human experience into evocative forms… they are the people that get me out of bed. They’re the ones who inspire me. Standing as a faculty mentor with Shannon at Honors Convocation, 2009. With grads Guigen, Zach, Amy, Simon, and Nikos at lunch during an art event, 2016. Photo by Waitress. Working with Emily during a summer drawing session, 2011. Photo by M. Kannan. I am incredibly thankful for the opportunities I’ve been afforded. My biggest motivation is to be effective as a person, educator, and artist. To make an impact and reveal the world to myself and others through the act of teaching and making artworks. As the years go by, it is the response of my students that gives me such deep encouragement. The lives of my students are glorious confrontations in the best of ways. They are the world brought to my classroom. Black, white, South Korean, Chinese, Brazilian, Caymanian, Russian, Japanese, gay, straight, trans, Muslim, Christian, Wiccan, conservative, liberal, questioning, broken, certain, self-actualized, brilliant, wondrous, and strange. They come in skittish and green, and they leave full of the power they’ve always had. It’s beautiful to see their transitions, and it never gets old. With former grad and then colleague David Spear. At Marcus Mier’s wedding. A portrait of me with Darth Vader by Jane Jun, 2013. Acrylic on canvas, 7 by 5 inches. Portrait of me as The Dude from The Big Lebowski by Jake Johnson, 2009. Acrylic on wood panel, 7 by 5 inches. This post hasn’t even really scratched the surface of what that last ten years have meant to me and what I’ve experienced. I haven’t even mentioned my passion for the Cast Collection or Rocking The First Day with Deborah. I haven’t spoken about how much I love Wakonse. I haven’t talked about the strange projects we’ve had to do, the cobbling together of nominal spaces for our students. I haven’t mentioned the glory of Dr. Melvin Platt’s parliamentary prowess or Ferrie and Brenda holding down all the details like heroes. There have been dozens more faculty and students who have made these years amazing. I’m so thankful, and every semester I try to be worthy of what I’ve received. Here’s to another decade! A group of my Color Drawing students at work, 2015. *I’m quoting Professor Corly Blahnik, Emeritus at ISU. Jacob Maurice Crook is a former student and current colleague of mine at the University of Missouri. He’s amazing. After completing his MFA at Syracuse a few years ago, he took a job with Mizzou and will leave us this fall for a fresh gig. Here’s to many years creating and supporting students in his new position! Jake has been a great friend over the years and was the first undergraduate with whom I had a strong rapport. 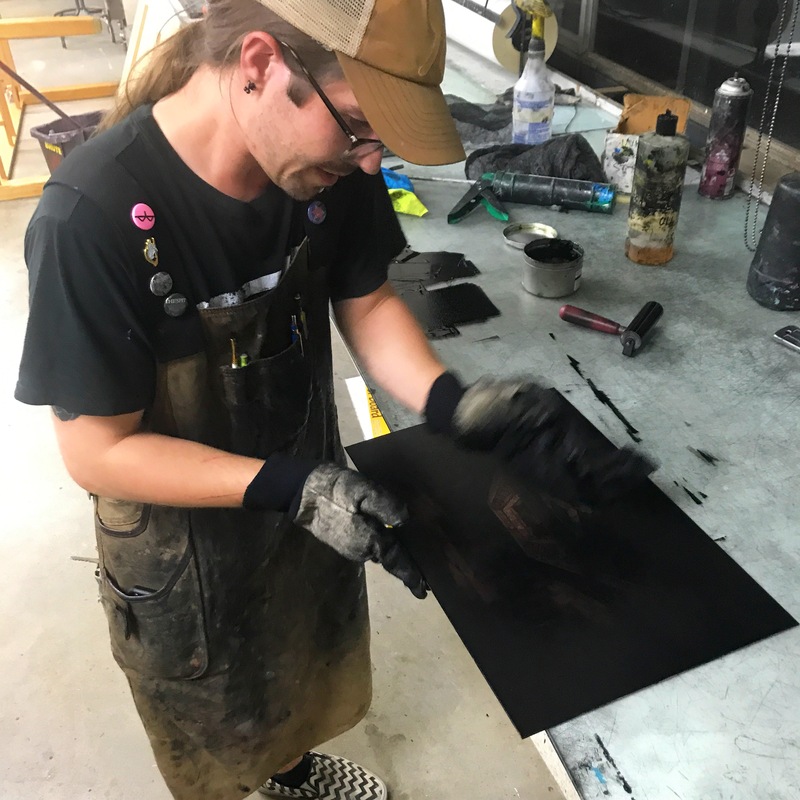 His technical skills in drawing, painting, and printmaking are second to none, but his passion to make art and leave a mark on students is just as impressive. It has been a joy over the last couple years to walk past the printmaking room and hear the glory going on inside while he was teaching. 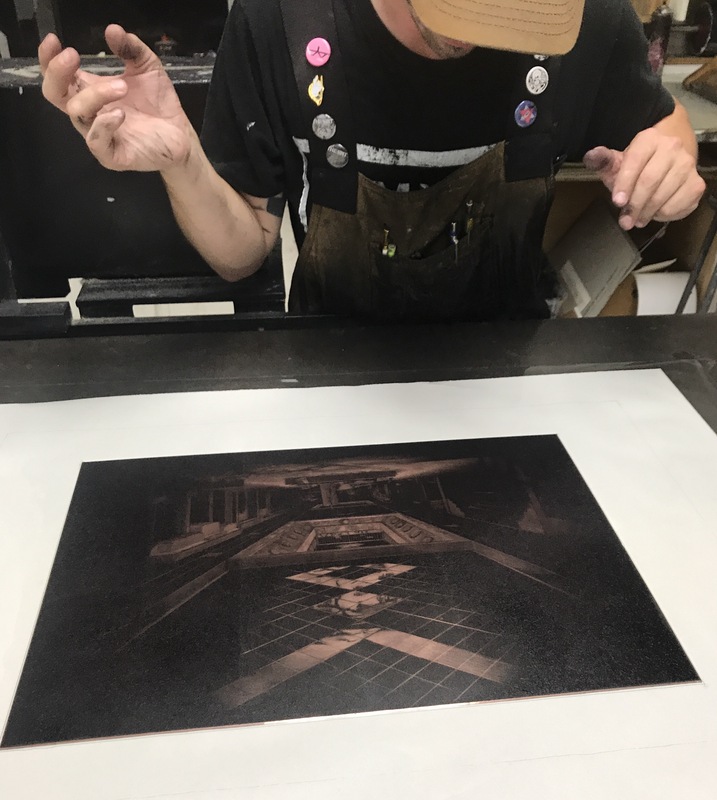 Nearly a decade ago Jake and I learned the mezzotint technique from Chris Daniggelis and, while I enjoy the medium and return to it often, Jake has become a master. 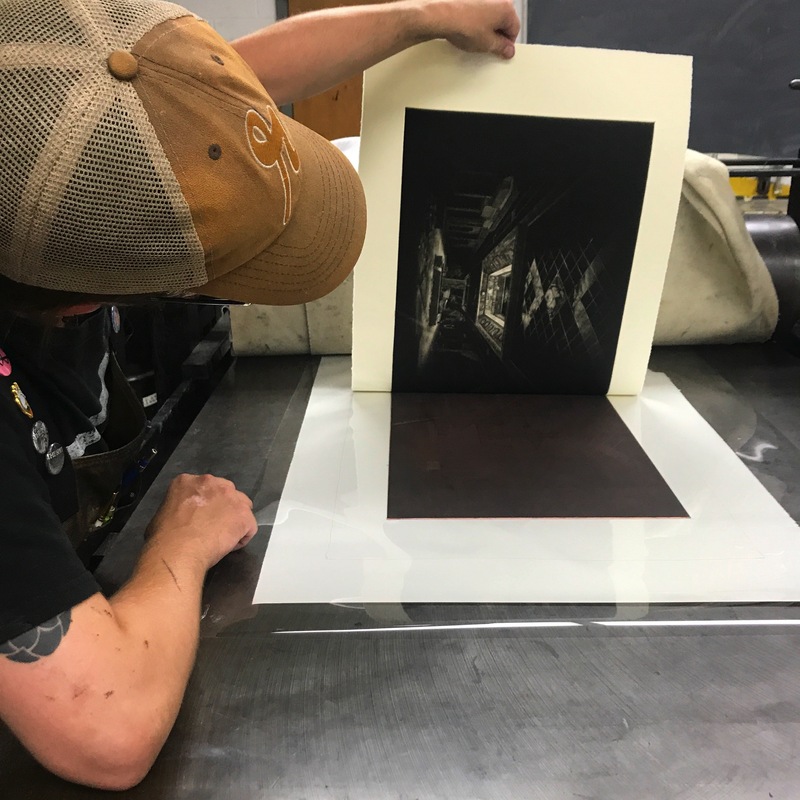 Last night I was able to hang out with him as he listened to some sweet doom rock and pulled a fresh proof of his newest mezzotint. See the images below. 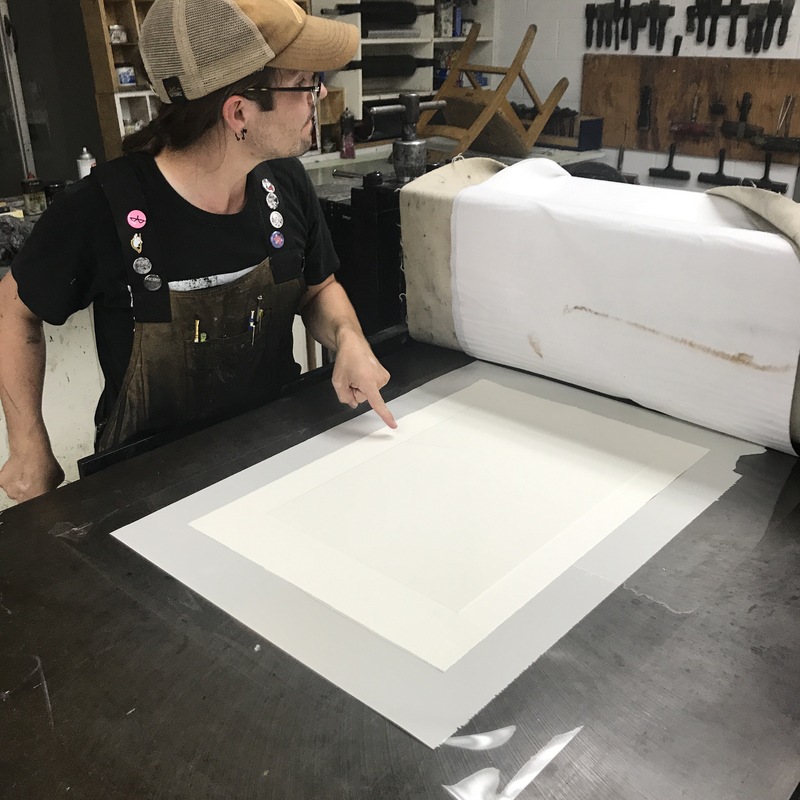 Placing the inked plate on a great old Charles Brand press – with a flourish! The plate ready for paper and pressure. Applying the paper – carefully. After the pass, assessing the situation. Jake is noting a place where the blankets slipped slightly. 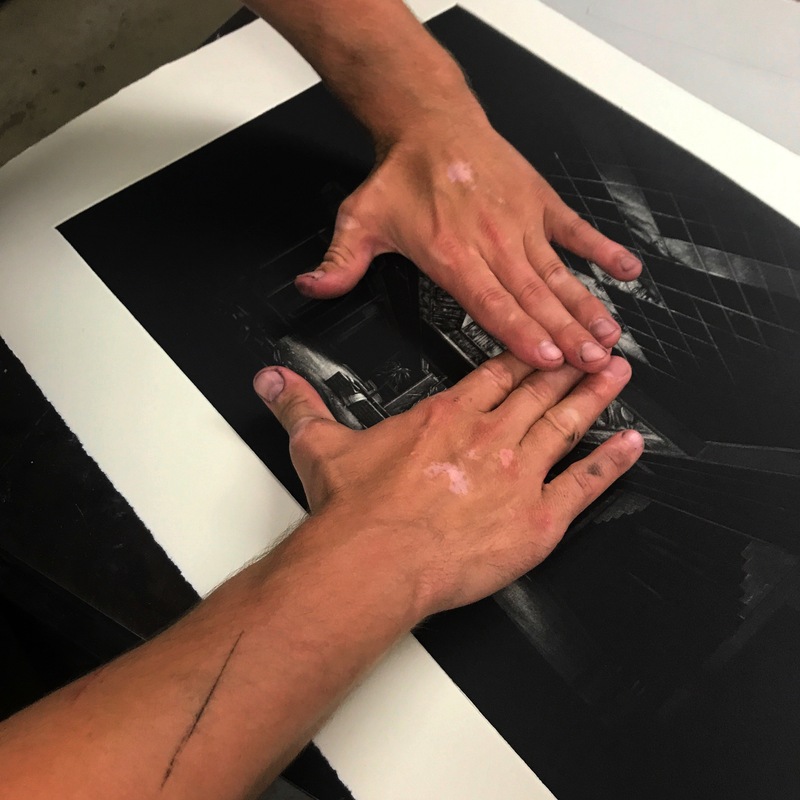 After inspection, Jake zeroes in on the parts that printed best and evaluates what the next steps are to make the image better. I can’t wait to see how the final piece turns out. It’s inspiring to see a master at work. So glad I’ve gotten to know and work with Jake over the last decade, and I’m looking forward to the next 10 years! RAWK! TOTALITY! AUTHORITY! One of my best students ever was Simon Tatum, a fantastic young man who recently graduated from Mizzou as an undergraduate. He is currently working for the National Gallery of the Cayman Islands on an internship, and his work is on display there now. 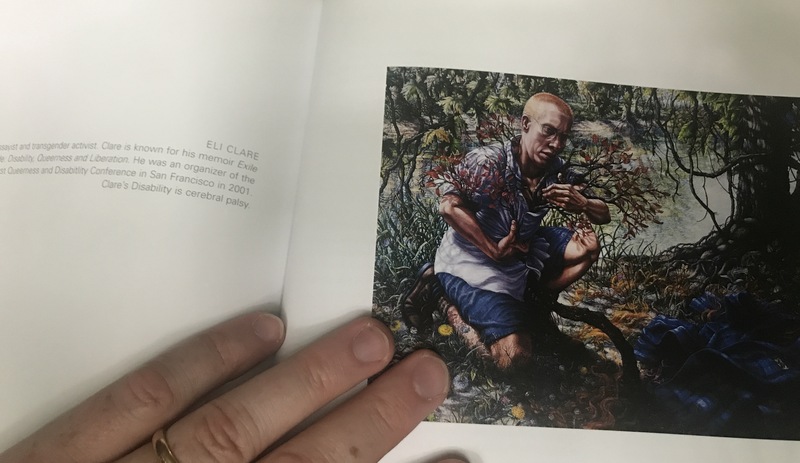 Simon has really demonstrated his quality as an artist and as a person over the years I’ve known him, and I am confident that he will be a leader in Caribbean art for many years. Before he left, Simon gifted this incredible study to me – below. It is a work of ink on Mylar (24 by 16 inches) that had been enamored with for a long time, and one that I consistently returned to gaze at as it hung on his studio wall for more than a year. 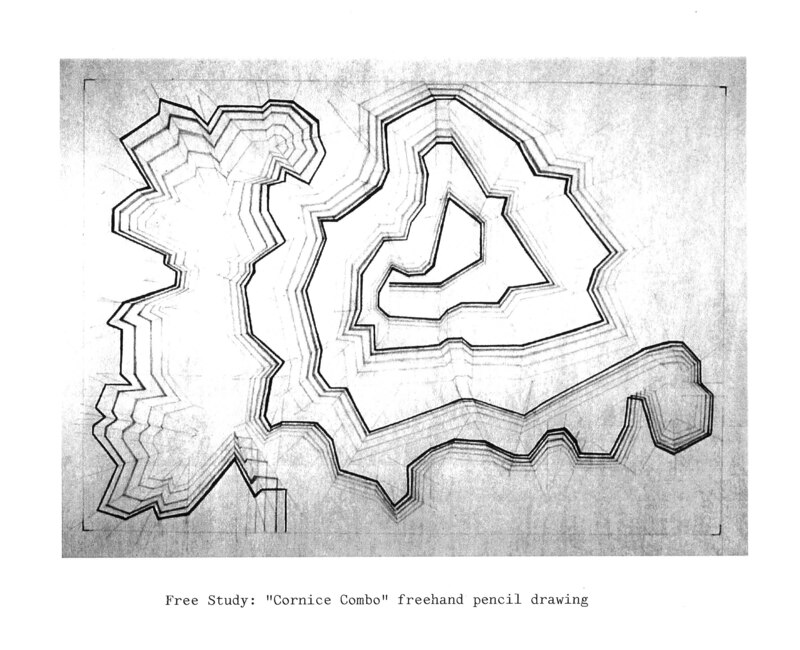 In some ways this work is a study, an early experimentation in the ink-on-Mylar technique that Simon explored for a good part of his undergraduate career. In other ways it presaged his current fascinations with Caymanian cemetery houses, the geometry of memorials, and the catalysts of memory that many human beings experience. I really love the piece and am planning to mount it in a light box so that it is back-lit… glorious. Simon’s work has inspired me, but he has also given me a deeper connection to one of the most important stories I’ve encountered: Donald Crowhurst and his Teignmouth Electron. The tale of Crowhurst and his voyage, as recounted in the fantastic documentary Deep Water, are items that come up frequently in my classes. A wonderful book about this strange episode is Peter Nichols’s A Voyage For Madmen. Seriously, go read it. The final resting place of the Teignmouth Electron is Cayman Brac, near where Simon grew up. It turned out that he knew how to find the boat, and so he visited it for me and others here at Mizzou who are interested. Just a couple weeks ago Simon, along with fellow Caribbean artist Blue Curry, visited the boat again to document its ongoing disintegration. Their photos have been posted here. A fragment of the Teignmouth Electron, washed away from the decaying wreck after Hurricane Paloma in 2007. The current state of the Teignmouth Electron, June 2017. Photo by Simon Tatum. Thank you, Simon! I can’t wait to see what you do in the future! I’m always on the look out for new books to add to my collection. 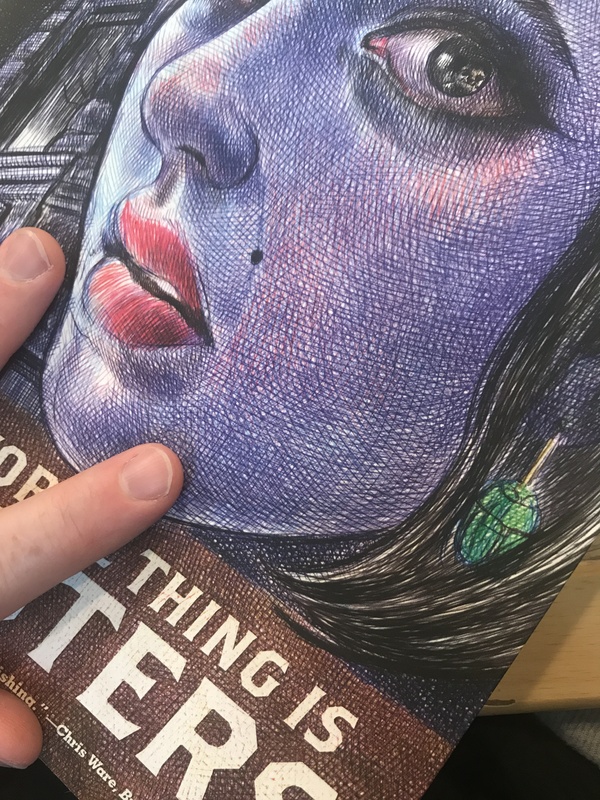 As an artist and educator, I know there is something wonderful about the physical feel of a book, the way the pages smell, and the beauty of a really high quality reproduction. Recently I’ve added the Diebenkorn Catalogue Raisonne, a wonderful investigation of Hilma af Klint, and some other texts. A few of the new books are listed below. Riva Lehrer is a profoundly important Chicago-based artist who has worked on disability and identity for her entire career. 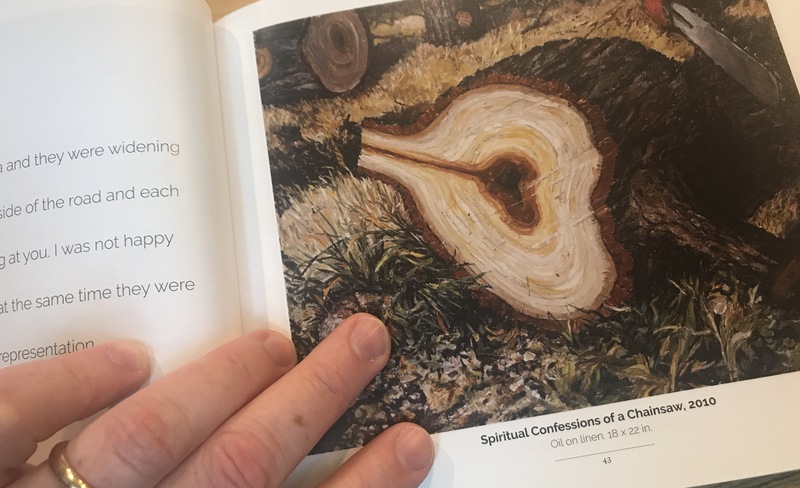 Circle Stories, put out by Gescheidle in 2004, is a wonderful way to introduce her work to my students and to commemorate the power and presence of her work. 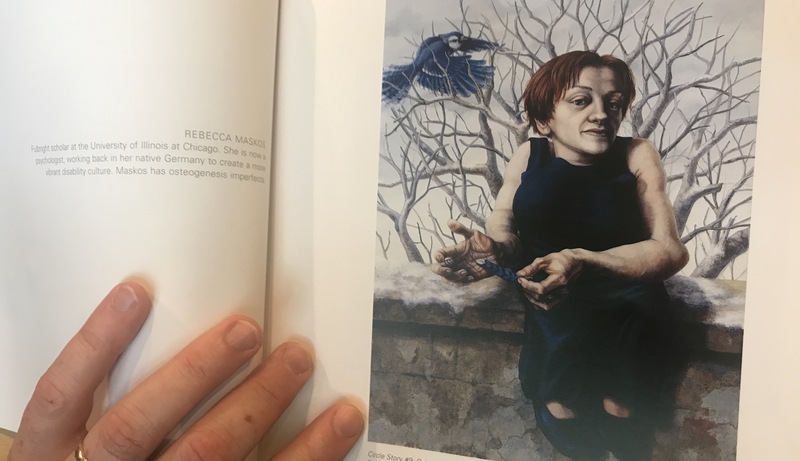 The portrait of Rebecca Maskos (above) is particularly special to me, as one of my daughters has osteogenesis imperfecta. I appreciate the leanness of the book. The statements are direct and clear. The images are evocative and give an indication of the passionate work and depth of feeling that Lehrer brings to her painting. I love Kelly’s Cove Press, a small publisher focused on California and Bay Area artists. Their Squeak Carnwath and Diebenkorn books are, to me, essential viewing for painters. I REALLY hope they plan to publish something on the drawings of Manuel Neri or the wonderful paintings of Kim Frohsin sometime soon. In this book, the work of Chester Arnold is featured. 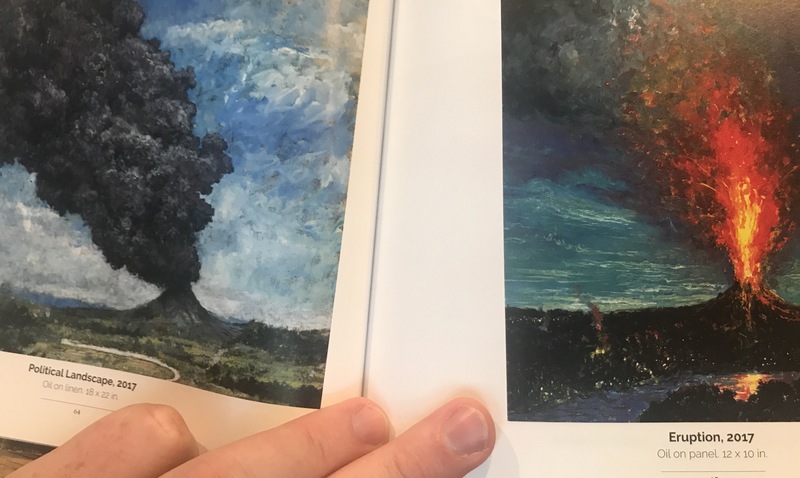 There is a wonderful play between smaller works and larger, more realized pieces in the design flow of the book. Covering a number of decades, this is an ideal introduction to Arnold’s work for those of us who aren’t as familiar with it. Frankly, I was blown away when I received the book. Arnold’s handling of narrative structure and symbolic force is rare. So much of contemporary representational painting pays lip service to story and metaphor without the depth necessary to deliver an image of lasting power. Chester Arnold really hits home with these paintings, and he’s been doing it for decades. Arnold’s manner of painterly facture, compositional array, and use of symbolic objects and associations strongly reminds me of the great Maine-based artist Robert Barnes, as well as the frenetic interiors of Gideon Bok (also working out of Maine). What an interesting show these three would make together. Ms. Ferris is a force of nature, and her first graphic novel is set to become legendary. Every single page is a wonder to behold. The story moves with a familiar strangeness, recalling the moodiness of fellow Chicagoan Chris Ware’s work. It’s also an ode to the Pulp Era and Hammer Horror films. 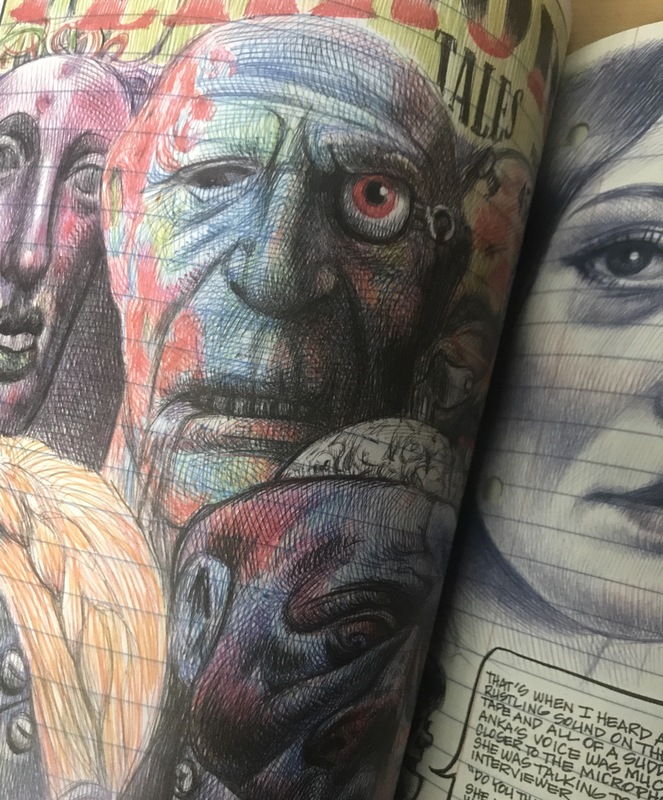 The artwork feels so close to the artist’s hand – the line quality and the sense of notebook paper (complete with “holes” for a 3-ring binder) are astounding. Ferris’s use of ballpoint pen exists here as both a limitation and an extravagant, magical tool. I also really love how Ferris constantly brings art history into her work as a real player in the story. She does this particularly with art that’s readily available to be seen in Chicago. The city, its buildings, its people, and its art are all palpably present. My suggestion would be to listen to the fantastic profile conducted by NPR here. I think you’ll find yourself as compelled as I was, and you won’t regret picking up this phenomenal book. My work as an educator is central to just about everything in my life. I’m constantly thinking about my students, working with them, trying to make my classes better, refining various projects, and generally just trying to be present in the process of their learning. I try to hold back on over-explaining myself to them – one of my biggest problems is giving the “answer” while still explaining the premise. In any case, it’s always good for me to look back over the academic year and see what students have made. Of course, as a Teaching professor, keeping a record of my students’ work is also key to my career. Mostly, though, I find that looking through the “best” of what they make tells me a lot about what I’m presenting to them. Sure, art is subjective in a number of ways. But it is also one of the oldest and most explored arenas in all of human history. As such it is a realm of much wisdom and meaning. How my students interpret and remix the ideas I give to them – whether those concepts are philosophical or technical – is an indicator of not only how well I have explained myself, but also how much has passed through me from those who came before. Here are some of the works my students have made over the last year. I’ll post them roughly in the order they would appear in class… basic projects, moving into more refinement and invention. Michael Flinchpaugh (Architecture). 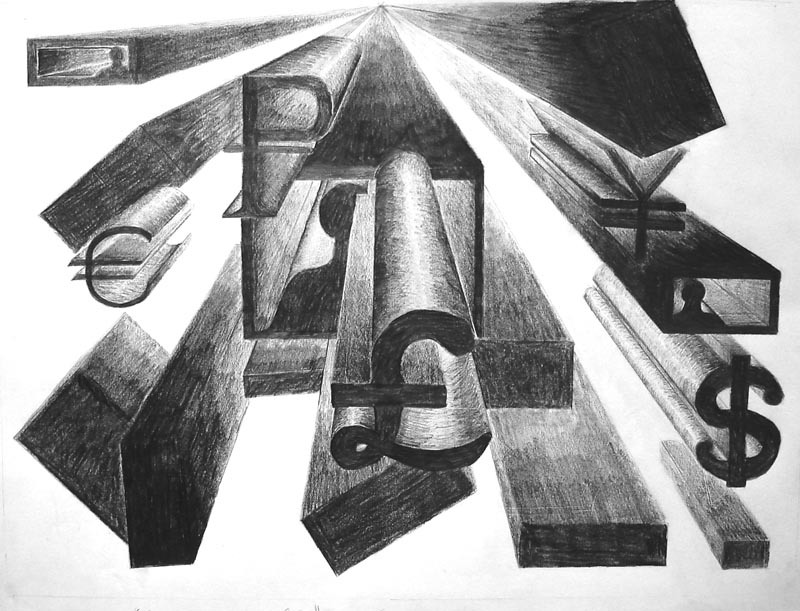 Perspective and Accumulation Study. Graphite on paper, 18 by 18 inches. 2016. Brittany Burnett (Architecture). Interior Space Project 1 (Art Building). Graphite on paper, 18 by 18 inches. 2017. Shannon Henderson (Journalism). Interior Space Project 1 (Art Building). Graphite on paper, 18 by 18 inches. 2017. Kearra Johnson (Art), Interior Space Project 2 (Jesse Hall). Graphite on paper, 24 by 18 inches. 2016. Shannon Henderson (Journalism). Interior Space Project 2 (Jesse Hall). Graphite on paper, 24 by 18 inches. 2017. Megan Feezer (Health Science). Interior Space Project 2 (Jesse Hall). Graphite on paper, 18 by 24 inches. 2017. Xinyi Hu (Religious Studies). Interior Space Project 2 (Jesse Hall). Graphite on paper, 24 by 18 inches. 2017. Michael Flinchpaugh (Architecture). Interior Space Project 2 (Jesse Hall). Graphite on paper, 24 by 18 inches. 2016. Shannon Kling (Art). Detail of Apollo, Gallery of Greek and Roman Casts – Museum of Art and Archaeology, University of Missouri. 18 by 18 inches, 2016. Now on display at the Museum. Emmalee Wilkins (English). Detail of Apollo, Gallery of Greek and Roman Casts – Museum of Art and Archaeology, University of Missouri. 24 by 18 inches, 2016. Now on display at the Museum. Kearra Johnson (Art), Self Portrait at Mizzou. Graphite on paper, 18 by 24 inches. 2016. Alex Knudsen (Communications). Self Portrait With Aliens. Graphite on paper, 18 by 18 inches. 2016. Mia Scaturro (Art) working on a self portrait in black and white colored pencils on gray paper, 2016. A chunk of “unicorn turd (oil pastel scrapings molded together)” collected by Color Drawing (Beginning, Intermediate, and Advanced) student Sterling Labarbera (Art), 2016-2017. Blessing Ikoro (Psychology). Grid Study 1. Chalk pastel on paper, 18 by 22 inches, 2017. Madalynn Olmsted (Art). Grid Study 2. Colored pencil on paper, 16 by 16 inches, 2017. Alexandra Sapaugh (Art). Complex Colored Pencil Study. Colored pencil on paper, 18 by 24 inches, 2017. Alexandra Rowles (Health Sciences). Complex Oil Pastel Study. Oil pastel on paper, 16 by 20 inches, 2017. Alexandra Sapaugh (Art). Complex Oil Pastel Study. Oil pastel on paper, 17 by 17 inches, 2017. Bridget McFerren (Art, Art History, Multicultural Studies). Lunch (Wings). Oil pastel on paper, 24 by 18 inches. 2016. Noor Khreis (Art). Reflection Self Portrait (In a sheet of bent metal). Chalk pastel on paper, 18 by 24 inches. 2017. Blessing Ikoro (Psychology). Reflection Self Portrait (In an ice bucket). Chalk pastel on paper, 24 by 18 inches, 2017. Madalynn Olmsted (Art). Reflection Self Portrait (In a pair of tongs). Oil pastel on paper, 15 by 24 inches, 2017. Bridget McFerren (Art, Art History, Multicultural Studies). Reflection Self Portrait (In a chrome sphere). Oi pastel on paper, 15 by 15 inches, 2016. Madalynn Olmsted (Art). Complex Lighting Arrangement 1. Chalk pastel and collage on paper, 18 by 24 inches, 2017. Alexandra Sapaugh (Art). Lighting Arrangement 1. Chalk pastel on paper, 18 by 18 inches, 2017. Alexandra Rowles (Health Sciences). Lighting Arrangement 1. Oil pastel on paper, 18 by 24 inches, 2017. Amazing work – I can’t wait to see what they do next!